Info:Ulf Christiansson: vocals, guitar | Anders Mossberg: bass | Klas Anderell: drums | Dan Tibell: keyboards | All songs by Ulf Christiansson, exept for "I’m still alive" ("Döden besegrad"), lyrics by Ulf Christiansson and music by Ulf Christiansson and Dan Tibell. | Songs written between 1974-1983. Swedish version released in 1996 on Fruit Records and MEP. English version released in 1997 on Alliance Music, UK and Europe and Jerusalem Music, Sacramento CA in US. During the time between 1975-1983, many songs were written but never made it on the records. Not because the songs were not as good but more for the reason of space (only 22 minutes on each side and Ulf wrote many songs over 6-7 minutes). 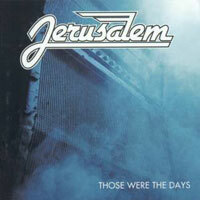 Years later, Ulf was reminded by a friend that there were many good songs that Jerusalem use to play “live” and why weren’t those songs on any records? So the idea came to record those songs now using the same band members of that time. So Ulf called Dan, Klas and Anders and asked if they wanted to come together for two records (there were about 40 songs all together). Everyone was excited about this. Listen to “Those were the Days” and “The Truth Has to Come”, still very great songs.